– Inlays are intracoronal (inside the crown) restorations that replace small to medium amounts of tooth structure. 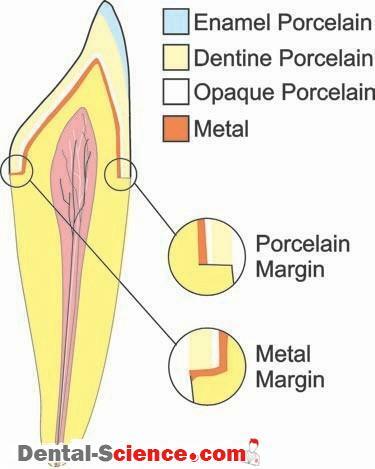 as proximal surfaces (Class II) of posterior teeth. – They do not restore the cusps. They are retained by luting cements. – Onlays (or overlays) involve replacing more tooth structure than inlays. – In addition to the pits, fissures, and proximal surfaces of an inlay, onlays restore one or more cusps and, at times, the entire occlusal surface of a tooth. – Onlays are used when the likelihood of cusp fracture is high. – The onlay protects the cusps from occlusal forces. – Onlays, like inlays, are retained with intracoronal retention and luting cements. – In dentistry, veneers are restorations that are placed on the facial surface of anterior teeth to treat an esthetic problem, such as discolorations, rotations, or spaces (diastemata). – Veneers are often used in conjunction with orthodontic or periodontal treatment. 1. Direct veneers use bonded composites. Direct veneers may not involve the removal of significant tooth structure. If tooth structure is not removed, such veneers are considered to be a reversible treatment. prepared to provide space for the veneering material. Therefore, indirect veneers are not a reversible procedure. appointment, and a laboratory fee. Therefore, they cost more overall than direct veneers. – At one time, composite materials were also used, but discoloration was a problem. – Today, porcelain is popular because a single veneer can utilize a variety of porcelain shades and translucencies. Indirect veneers are supported by, and are bonded to, the underlying tooth structure. – Crowns are used to restore teeth that have lost a significant amount of tooth structure. surrounded and held together by the restoration. – Complex restorations combine the features of inlay, onlay, and crown restorations. – A bridge replaces missing teeth. – Typically, a bridge has a crown, called a retainer, at each end. – The retainers are supported by teeth called abutments. – The replacement teeth are called pontics. – A bridge may replace one tooth or several teeth. – A variety of metals are used to restore teeth. – Most metallic indirect restorations are made by a casting procedure. – Casting involves melting the metal and then pouring or forcing the liquid metal into a mold. – The casting process allows custom, complex shapes to be easily produced. – Metals are very tough and work well in high-stress situations, but their esthetics are poor. – Ceramic materials are used when esthetics are important. – Ceramic materials can simulate the natural colors and translucency of teeth. colors or shades for a single crown. – A variety of materials and processing techniques are employed. – Most ceramic materials lack the toughness and fracture resistance required by bridges, but their esthetics can be excellent. 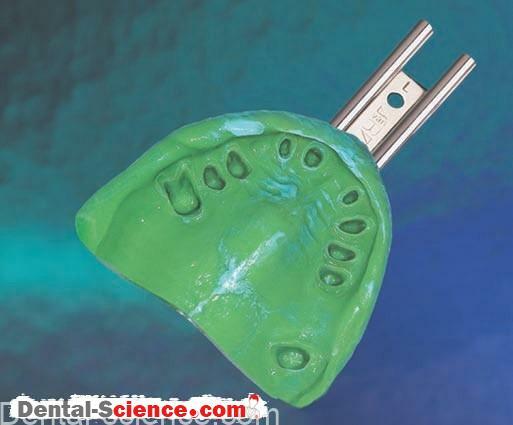 – A metal–ceramic combination was developed for dentistry in the 1950s. – This material is made by using the same process to bake enamel (porcelain) on metal as that was used to make old-fashioned pots and pans or sinks and bathtubs. – The tough, strong metal supports the weak but esthetic ceramic material. – The restorations are called ceramo–metal restorations (or porcelain-bonded-to metal or porcelain-fused-to-metal crowns) and are considered to be an important “workhorse” in modern restorative dentistry. – Particle-reinforced composite materials (very similar to those discussed in Direct Polymeric Restorative Materials) have been adapted for use as fixed indirect restorations. – These material are reinforced by irregularly shaped particles. – They are cured at elevated temperatures, pressures, or both in the dental laboratory. – Particle-reinforced composites have seen only limited success because their strength and toughness do not meet those required by crown and bridge materials. – Recently, fiber-reinforced composites have been developed for dentistry. industries in which glass fibers are used to reinforce polymeric materials. – Imagine a bowl of frozen, leftover spaghetti with sauce. –The spaghetti represents the glass fibers; the frozen sauce represents the polymer matrix. – The long fibers transfer stresses over a larger area than particles do. – Automotive, aerospace, and sports equipment companies use fiber-reinforced composites to manufacture strong, lightweight products. – Clinical results are promising, but these materials have not been commonly used in private practice. – Lost tooth structure and missing teeth result from a variety of causes. – Caries and periodontal disease are the most common. – An extreme case involving caries and periodontal disease. restore or replace teeth. Often, teeth are lost as the result of restoration and re-restoration and multiple dental treatments. – A variety of factors affect the success of a restoration. long-term success of any restoration is unlikely. periodontal and periapical condition of the tooth. caries should precede extensive and expensive restorations. D) Enough tooth structure must remain to retain the restoration. Badly broken-down teeth may require buildups (also called cores) to provide retention of the final restoration. selection of the restorative material to be used. (B) The attrition (wear) rate of the restoration should be considered. (C) Biocompatibility of the material must be considered. gingival sulcus. Margin location affects esthetics, retention, periodontal response to the restoration, and likelihood of recurrent caries. – The tooth or teeth are prepared with specific restorative materials in mind. – Different materials require different amounts of tooth reduction and shapes of the margins. – Full arch impressions result in more accurate articulation of models and less adjustment of a complex restoration before cementation. – The patient will not like the appearance and feel of the prepared tooth. – In addition, exposed dentin can be very sensitive to heat, cold, and air. – A temporary restoration (also called a provisional restoration) is constructed and cemented at the time of preparation. – The temporary restoration is left in place until the final restoration is received from the lab and permanently cemented. – The description and design of the restoration is written on a laboratory prescription. – This prescription becomes a part of the patient record. 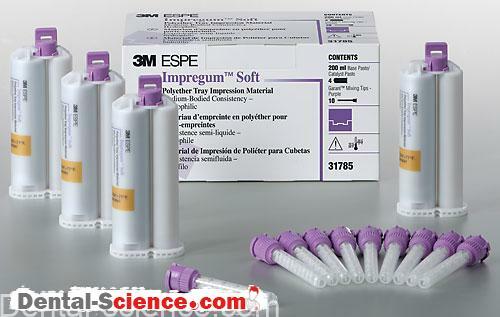 – Impressions are disinfected, then poured in the dental office or a commercial laboratory. – The laboratory constructs the final restoration according to the dentist’s instructions. – At a second appointment, the temporary crown is removed, and the temporary cement is cleaned from the prepared tooth. – Scaling instruments or pumice and a prophy cup are used. – “Try-in” of the restoration is next. – The restoration is seated on the preparation and carefully evaluated. – The proximal contacts are checked with floss. – The margins are examined with an explorer. 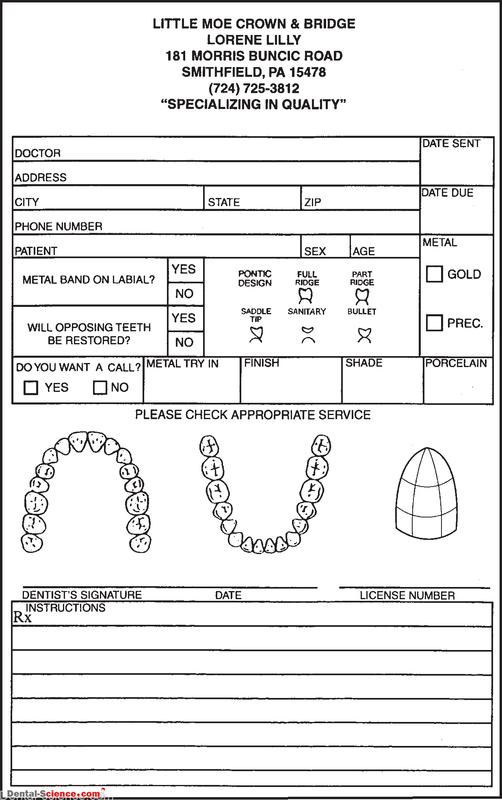 – The occlusion is evaluated with articulation paper; and the esthetics are examined with the patient’s input. – If all is acceptable, the restoration is cemented. – After the restoration is cemented, the remaining treatment plan is completed. – The final step in the treatment plan should be to determine the recall status of the patient based on periodontal concerns, caries risk, chronic problems, and oral hygiene home care practices. – This process first constructs the restoration in wax. – The wax is then replaced with metal in the same shape and size as the original wax pattern. – Wax is easy to mold and shape. – All that is required is a heat source and a few simple instruments. – Creating the shape of the restoration in wax (wax pattern) requires skill and involves both the art and the science of dentistry. – The art is creating a reproduction of the shape of the lost tooth structure. – Dentistry uses a variety of waxes with different melting, working, and handling properties. 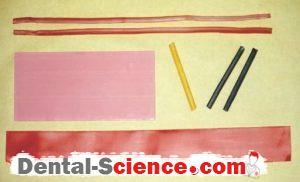 – Wax is very soft compared to other dental materials. – Distortion of wax is not typically visible to the unaided eye, but wax is unstable. – A wax pattern can distort over time to a degree sufficient to affect the fi t of restorations. 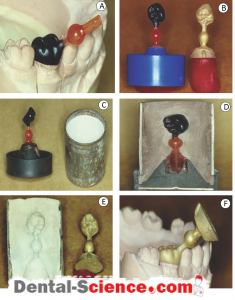 (A) Inlay casting wax is used for casting inlays, crowns, and so on. Inlay casting wax is unique in that when it is heated to a sufficient temperature, it will burn away completely, leaving no residue. This feature is part of the specification for inlay casting wax. These waxes are hard and have higher melting temperatures compared to other waxes. Inlay waxes are not “sticky” to the touch. Other dental waxes have different handling characteristics. (B) Sticky wax is a hard wax that melts at a higher temperature. When sticky wax is applied to an object in the molten state and then allowed to cool to the solid state, it sticks well (for a wax). (e) Dental waxes are quite costly when compared to paraffin wax used to preserve jelly and jam. The additional cost results from the purity of the components and the complexity of the formulation. Compared to other dental materials, dental waxes are very inexpensive. The different dental waxes work quite well and, surprisingly, have not been replaced by newer, “hightech” materials. – The casting process forces molten metal into the empty space of the mold. – The mold is made by investing a wax pattern. 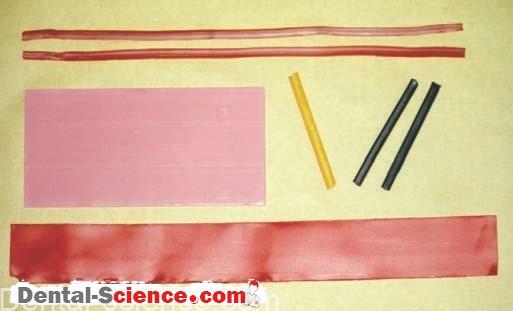 – The wax pattern is surrounded by and embedded in a mold material. – When the wax is removed, the mold space is created. – The wax pattern is the exact size and shape that the resulting casting will be. – A sprue is a plastic or metal tube that will form an opening (or ingate) for the mold. – It is attached tothe wax pattern. – With the sprue used for support, the wax pattern is attached to the sprue base. – A casting ring is used to form the outside of the mold. – The invested pattern is heated, and the wax is melted and flows out of the mold. – As the temperature rises, any residual wax is burned away. – This heating procedure is called “wax burnout. – ” Burnout results in a mold space into which the metal is forced or cast. – The most common investment materials are gypsum-based products. – The same handling characteristics discussed in Gypsum Materials for gypsum products apply to gypsum bonded investments. 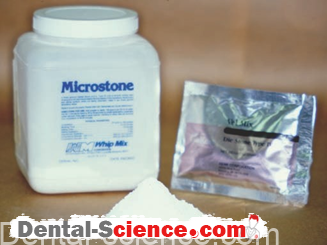 – A silica material is added to dental stone to produce gypsum-bonded investments. – A second (and equally important) function is that the refractory material increases thermal expansion of the mold. – The mold must be expanded to compensate exactly for the thermal shrinkage of the solid metal casting as it cools to room temperature. – If mold expansion does not compensate for the thermal shrinkage, the casting will not fit. – Metals typically shrink much more than ceramic materials. – They exhibit a sudden increase in expansion at an elevated temperature. 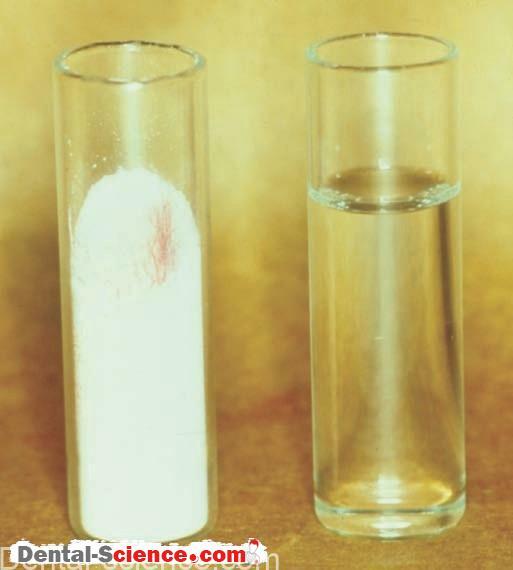 – The amount of expansion and the temperature at which the expansion occurs depend on the silica material used in the investment. – Different investment materials expand by different amounts at various temperatures. – A temperature-controlled oven is used to burn out the wax pattern invested in the casting ring. – The casting ring is placed in the oven, and the mold is heated to 500 to 600°C (900–1,100°F). – The wax melts and is volatilized, leaving a clean mold space. – The casting ring is left in the oven after reaching the desired temperature for approximately 30 minutes to 1 hour to “heat soak” the ring. – Heat soaking the ring assures that the entire wax pattern has burned out and that the mold has reached the desired temperature. 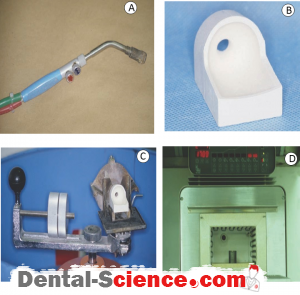 – Several types of equipment are used to make dental castings. -The casting process involves melting the casting alloy and then forcing it into the mold space. – The technique used to melt the alloy depends on the melting temperature of the alloy. compressed air and natural gas (used to heat homes and offices). – The alloy is melted while sitting in a refractory ceramic device, called a crucible, which is part of the casting machine. – Alloys with higher melting temperatures require oxygen or acetylene gas. – Other methods to melt casting alloys include electrical resistance heating (as in a toaster) and induction melting. – It rapidly spins the mold, crucible, and molten alloy in a circle. – Casting occurs when spinning suddenly starts. – While the crucible, molten alloy, and mold are rapidly accelerated, the inertia of the liquid metal causes the alloy to stay in place. – The alloy seems to flow out of the spinning crucible and into the spinning mold. – In reality, the molten metal stays in place; the casting ring spins and collides with the molten alloy. – The liquid metal is forced to flow into the ingate of the ring previously occupied by the sprue. previously occupied by the wax pattern. – When the metal cools, it solidifies, and the casting is complete. – The most common casting machine has a coiled spring that is wound up. – The energy stored in the wound spring is used to rapidly spin (accelerate) the rotating arm of the casting machine. – The mold is accelerated into the molten metal as the spring unwinds. – The rotating arm is composed of two parts connected by a pivot point; thus, this device is called a “broken-arm” casting machine. –The pivoting of the arm keeps it at the proper angle to allow the molten alloy to flow into the mold. – Other types of casting machines use a vacuum or compressed air to force the molten metal into the mold. – The crucible and casting ring are stationary; only the molten metal moves. investment and exposing the casting. – The casting is cleaned. – The metal that represents the sprue and casting button (excess metal) is cut off and can be reused. – The casting is finished and polished. – This is done by using a variety of abrasives. – Cast metal restorations use alloys rather than pure metals. – Alloys are metals that are a combination of several elements. – Traditionally, casting alloys for all-metal restorations have been gold alloys, thus the name full gold crown or gold inlay. – Pure gold is not used because it is too soft. – Gold (_75% by weight) is combined with copper (_5%), silver (_10%), palladium (_2%), zinc (_1%), and other elements to form high-noble dental alloys. – Percentages of elements vary depending on the type of casting alloy and the manufacturer. – The properties of dental casting alloys are described in the American Dental Association (ADA) specification. – The specification has no composition requirements but does have performance criteria for strength, elongation, tarnish resistance, and biocompatibility. – Elongation is a measure of the ability of a material to be stretched before it breaks. – Elongation is used to predict the ability of an alloy to be burnished. – Burnishing margins of soft, malleable gold restorations pushes the metal against the tooth to close any gap between the tooth and the casting. – Therefore, a margin or gap between the burnished. – Less cement is needed to fill in the space. recurrent caries during clinical service is decreased when margins are burnished. – Four types of casting alloys are described in the ADA specification: Types I, II, III, and IV. – The differences between them are predominantly the strength and elongation of the casting alloy. – Type I is the weakest, has the greatest elongation, and is used for inlays. – Many terms are used to describe metals. – Some have precise meaning; others do not. 1. Metals are classified as noble elements based on their lack of chemical reactivity. The noble metals include gold, platinum, palladium, and other inert metals. 2. Precious metals are classified based on their cost. Precious metals are the noble metals and silver. – The gold content of alloys can be described several ways. 1. Percentage is parts per 100. 2. Carat is parts per 24. 3. Fineness is parts per 1,000. 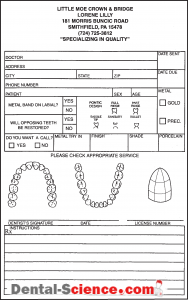 – Dental alloys for all-metal restorations can be classified by their composition. 1. High-gold or high-noble alloys contain 60% or more gold and other noble elements. They are usually yellow metals. replaced by increased silver content. Low-gold alloys are yellow or white metals. 25% palladium. These alloys are white (silver) in color. 4. Alloys with less than 25% noble elements are called predominantly base metals. 5. The term “non-precious” is used to describe alloys without any noble elements. – Casting alloys for ceramometal restorations have the same mechanical and biocompatibility requirements as alloys for all-metal restorations. – The ceramometal alloy must withstand the very high porcelain firing temperatures. – These temperatures are much higher than the melting temperatures of alloys for all-metal cast restorations. – It is important that the metal not melt or distort because the ceramometal alloy supports the porcelain during fi ring and clinical use. (A) After the metal substructure (or coping) is waxed and cast, the metal surface is cleaned. (B) The next step is to oxide the surface of the metal by heating the casting in a porcelain oven. A porcelain oven reaches temperatures much higher than a typical burnout oven and has more precise temperature control. 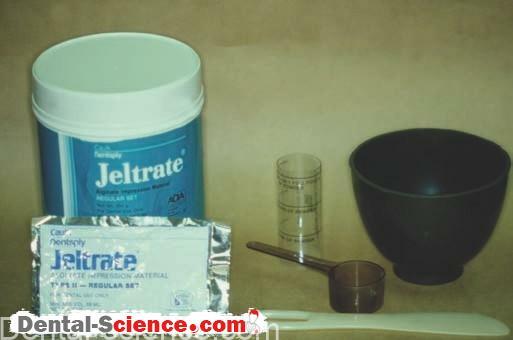 Adherent oxides form on the metal surface and function to chemically bond the porcelain to the metal. elements are added to ceramometal alloys to form these adherent oxides on the surface. Common examples are tin, indium, and gallium. 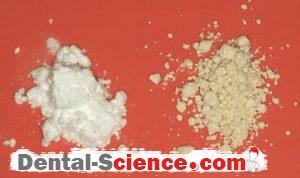 (C) Porcelain is supplied by manufacturers as powders. Each shade has its own powder. Porcelain powders are applied (or stacked) in layers. Each layer has esthetic properties to simulate the appearance of the layers of teeth, dentin, and enamel. layer and covers the gray, oxidized surface of the metal. The opaque layer is fi red before adding subsequent layers of porcelain. (E) The second porcelain layer is the dentin or body porcelain shade or shades. locations on the same tooth. (F) After the body layer, the enamel or translucent layer is applied. This is the most translucent of the porcelain materials and gives the restoration a more natural appearance. – Firing porcelain causes the powders to become “sintered.” Sintering changes the porcelain from a powder to a solid. – The powder is not melted, so the general shape is maintained. – The process of sintering is similar to that of making a snowball. – The snow is not melted; instead, the snow is compacted together. – Sintering porcelain is the same process that is used to fire clay pots, china, and ceramic tiles. – Reducing the porosity of the resulting product is very important. – The less porous (more dense) the product is, the greater the strength of the final product will be. – After sintering, the final shape of the restoration is refined by grinding. – Stains and glazes can be applied and fired to produce the shade detailed in the laboratory prescription. – Ceramometal alloys can be classified in many ways. – The following is one example. – The high-noble alloys for all-metal restorations were modified for porcelain bonding. – Gold (_88%)–platinum (_4%)–palladium (_6%) alloys were developed first. – No (or very little) silver and no copper are used. – These alloys are yellow in color (like gold alloys for all-metal restorations) but have a higher melting temperature to withstand porcelain application firings. – Gold (_50%)–palladium (_40%) alloys are white in color. – They possess better mechanical properties than gold platinum-palladium alloys. – Today, these are the noble alloys of choice for ceramometal restorations. – Palladium (_60%)–silver (_30%) alloys are less costly and are white metals. – High-palladium (_80%) alloys are also white in color. – They are less costly than the gold-containing ceramometal alloys but more expensive than the palladium–silver alloys. melting temperatures than the noble ceramometal alloys. – They tend to be stronger and harder than the noble ceramometal alloys and are much less expensive. – Chromium (_65%)–cobalt (_25%) alloys are also white and inexpensive. – They have the highest melting temperatures and are the most difficult to cast. – Their mechanical properties are similar to those of the strongest nickel–chromium alloys. – Titanium is the most biocompatible metal. to be made from titanium. – Current titanium us is limited. – It will most likely increase in the future as titanium restorations become easier to produce. – Titanium has been used as the material of choice for dental implants for decades. – If handled properly, titanium can osseointegrate with bone. – Osseointegration is a type of biologic bonding of bone to a material. – At one time, the frameworks of partial dentures were made with gold alloys. – The large amount of metal required to construct a framework makes using gold alloys quite expensive. – As a result, less expensive alloys from the aerospace industries, such as nickel–chromium and cobalt–chromium alloys, were adapted for removable partial denture frameworks. these non-precious alloys were modified for use as crown and bridge alloys. – The high melting temperatures these alloys require slightly different casting techniques and investment materials. – Silicate- and phosphate-bonded investments are used to cast high-melting partial denture framework alloys and ceramometal alloys. – They can withstand much higher burnout temperatures and are more difficult to use than gypsum-bonded investments. – Dentistry has been in love with porcelain ceramic materials for more than a century. to simulate the appearance of teeth. – Porcelain jacket crowns were the first all-ceramic restoration used in dentistry. – The entire crown is made of porcelain. – Unfortunately, the mechanical properties of this brittle material are inadequate for restoring most areas of the mouth. – Porcelain jacket crowns are made by applying porcelain powders in layers onto a thin layer of platinum foil that is adapted to the die. – Platinum is an element with a very high melting temperature. – A very translucent and natural appearing restoration results. 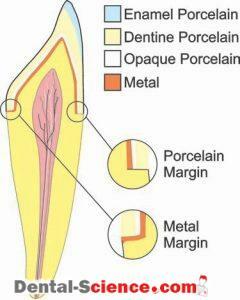 – To strengthen the porcelain, it is bonded to metal. a precise fi t of the crown to the preparation. – The disadvantage is that metals are opaque to light, even when used in very thin layers. – Light is not transmitted through the restoration as it is through tooth structure. – Therefore, a ceramometal restoration is not as natural or lifelike in appearance compared to an all-ceramic crown. 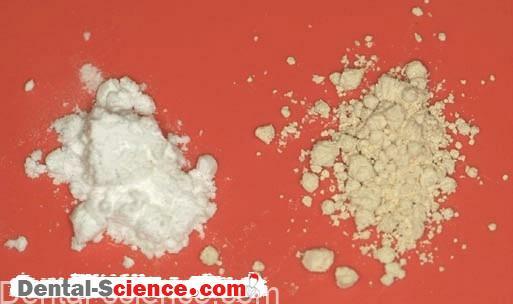 – Alumina (alumina oxide) was added to porcelain to increase strength. clinical performance without affecting esthetics. Unfortunately, this marginal improvement was not sufficient enough. – The search for stronger ceramic materials resulted in significant improvements in all ceramic restorations. (A) Castable Glass. First, castable glass materials were developed. The glass is cast much like metals are cast and is then given a strengthening heat treatment. This dental material is similar to the material used to make CorningWare® baking dishes and is called Dicor. propershade porcelain produces the desired shade. Castable glass is an improvement over porcelain, but it is too weak for many clinical needs. popular, including use for some bridges. Unfortunately, occasional fractures still occur even with this improved strength. Proper case selection is important. an “optical” impression, rather than a physical impression, of the preparation. 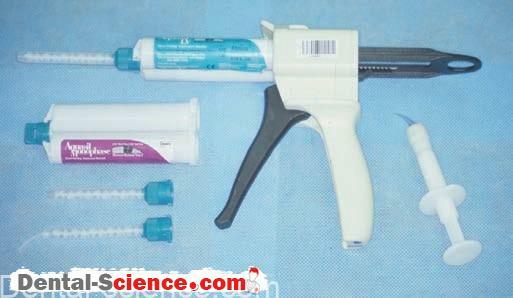 control in the dental office or dental laboratory. Porcelain and stains may be used to meet the patient’s esthetic needs. 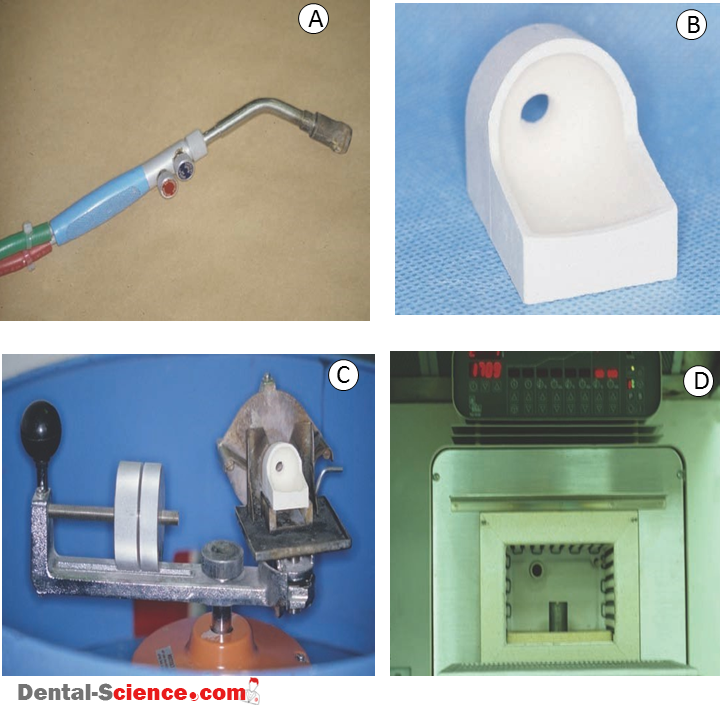 This technology continues to be developed and may become an important technique for the manufacture of ceramic restorations in the future. Zirconium oxide high strength ceramics require CAD/CAM techniques. such as metals and composites. – Metals are tough, and fractures of metallic restorations are quite rare. – On the other hand, all-ceramic restorations do fail and are only recommended for certain teeth. – Restorations for teeth that do not experience high occlusal forces, such as a maxillary lateral incisor, have high success rates. – Restorations for teeth that do experience high occlusal forces, such as first molars, have a lower success rate. – Materials for all-ceramic restorations have improved greatly in recent years, and their use in moderate stress areas of the mouth, such as anterior teeth and premolars, has been very successful. – Ceramometal restorations are used in all areas of the mouth. – Fracture of the porcelain is not common, but this is the most common mechanical failure. – Mechanical failure of the metal substructure almost never occurs. – Depending on the complexity of the restoration and the location of the porcelain fracture, this may be a nuisance or a disaster. location of the restoration and the patient’s preferences. 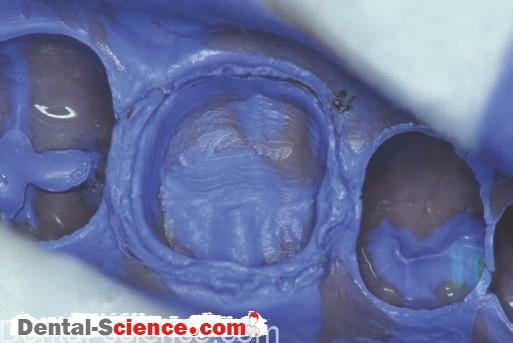 – Ceramometal restorations adequately simulate the natural dentition in most situations. – All-ceramic restorations have the most lifelike appearance of all restorative materials. 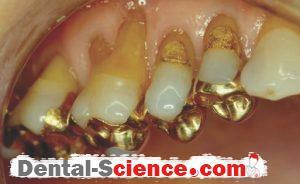 – They wear the opposing enamel much more than enamel or gold alloys. – Newer ceramic materials are a significant improvement but still may cause excessive wear in some patients. 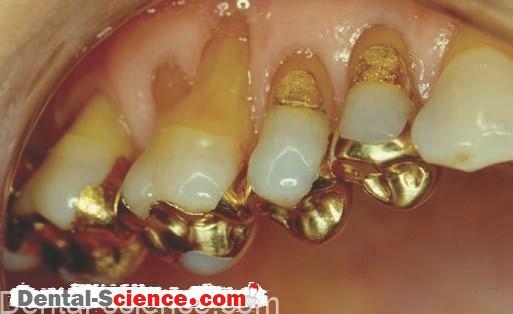 – The softer gold alloys wear opposing enamel much like enamel does. – An excessive gap at the margin of an all-ceramic restoration increases the risk of recurrent caries. – Luckily, modern dentistry has adhesive composite cements to fill the marginal gap of ceramic restorations. – Advantages and disadvantages exist for each restorative material and must be assessed on a case-by-case basis. – The patient should be made aware of the “pros” and “cons” of each type of material and be included in the decision. is important to the success of any procedure.